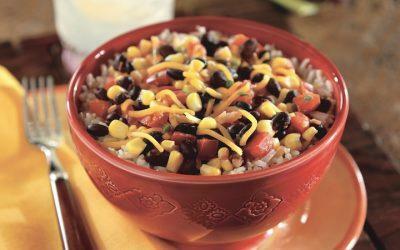 Combine tomato, salsa, beans, corn, cilantro, garlic, and ground red pepper in 1-quart microwavable bowl. Cover with vented plastic wrap. Microwave on high 1 to 1 1/2 minutes or until heated through; stir. Microwave rice in separate 1-quart microwavable dish on high 1 to 1 1/2 minutes or until heated through. Top with tomato mixture and cheese, if desired. Variation: To make this vegetarian dish even more satisfying, add pinto beans. Serving size: 1/2 of total recipe. Exchanges per serving: 2 Bread/Starch, 1/2 Vegetable.